Today's Insider Steal is this Nico 7 Piece Cotton Duvet Cover Set for ONLY $37.99 (Retail $277.89)! The Urban Habitat Nico 7 Piece Duvet Cover Set offers a fresh and charming update to your bedroom. 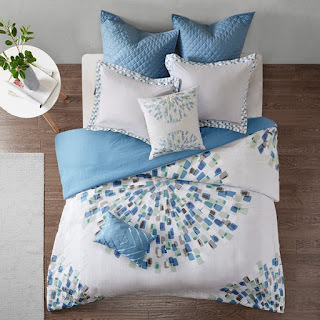 Featuring a large medallion pattern in blue, green, grey, and white hues on a light grey base, this 100% cotton duvet cover creates an eye-catching look with casual style. Corresponding designs in the corners and a solid blue reverse complement the bedding set. The shams showcase a two inch flange that repeats the pattern seen on top of the bed, while quilted Euro shams add a soft texture. An embroidered oblong pillow and a decorative square pillow in coordinating colors provide the finishing touches to this duvet cover set.